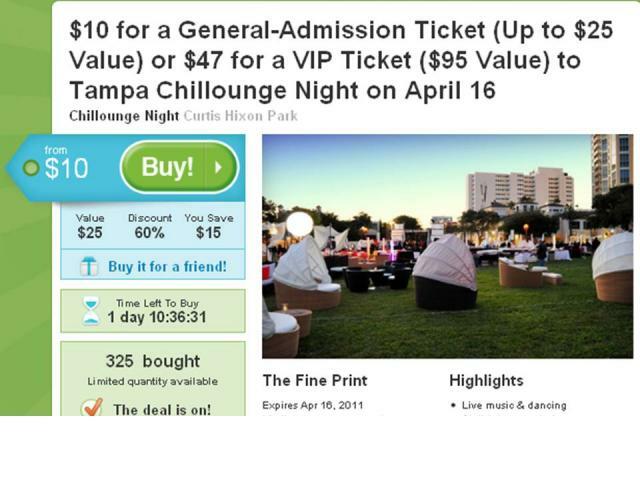 Chillounge Night on Groupon TODAY!!! Hey Tampa, Lisa here with an awesome Groupon for an even more awesome event THIS SATURDAY night! If you haven&apos;t heard of Groupon, or ever purchased one, now is the time! Since the Tampa Bay Weather has been so amazing lately this is a perfect opportunity to get out and enjoy it. Saturday night in Curtis Hixon park downtown Chillounge will be taking place. The Groupon is $10 for a regularly priced $25 general admission ticket. And then $47 VIP ticket for a regularly priced $95 ticket. The general admission ticket lets you into the festivities where there will be plenty of cash bars, food from Malio&apos;s Prime Steakhouse, fireworks, music and much more. The VIP ticket (which you have to be 21 to order), gets you free food and drinks plus a cigar; all in a private lounge. So if you&apos;re looking for Things To Do In Tampa Bay, look no further! Come on out to Curtis Hixon Park at 6pm Saturday night. But don&apos;t forget to buy your Groupon TODAY!!! That&apos;s all for now, but check in later for other Tampa Bay Area Events!